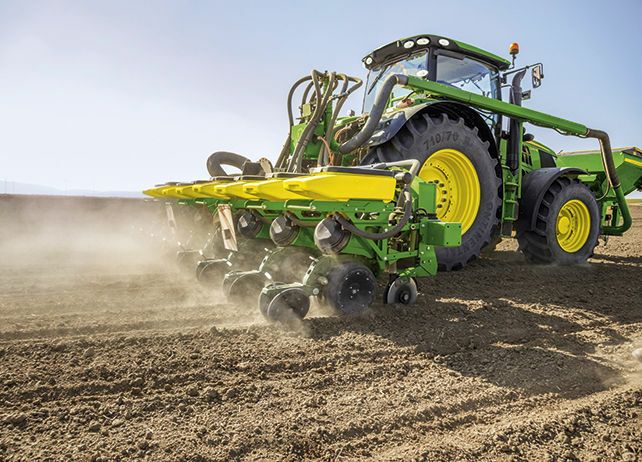 If high precision farming is your business, RTK is still your best solution when it comes to accuracy, repeatability and pull-in time. RTK eliminates any possibility of GNSS drift and offers you unique +/- 2.5 cm pass-to-pass accuracy. With RTK you only need to record field boundaries once. If you need this repeatability for e.g. Section Control you will not like to come back and record boundaries every year. And you will save time every day: Full RTK accuracy is always available from the very start. It takes less than 1 min! As a Starfire 6000 RTK customer you receive up to 14 days of RTK Extend. If your line of sight to the base station is interrupted or you lose the cellular network using Mobile RTK, you can continue to work with full accuracy and even take this advantage outside of your RTK network. Radio RTK works with a static local base station in or near your field. This can be your own station or a station of a dealer-run network. It monitors the constellation of GPS/GLONASS satellites and continually transmits the high-accuracy +/- 2.5 cm horizontal pass-to-pass and +/- 5.0 cm vertical pass-to-pass corrections to the StarFire Receiver on the RTK-equipped vehicle. A Mobile RTK correction signal is transmitted via cellular technology. This provides repeatable accuracy, even in scattered fields and in hilly terrain. The new Mobile RTK Modem 4G LTE is fully integrated and attachable to the StarFire receiver. With two high performance antennas and the mounting position on the cab roof you truly have optimal reception and signal stability. It not only supports the latest 4G LTE mobile communication standard but also 3G as well as 2G. If you lose network coverage, you profit from up to 14 days of RTK Extend mode. Discover the easiest and most efficient way to use RTK – with the new original John Deere Mobile RTK signal. It is not only compatible with the new John Deere Mobile RTK 4G LTE Modem but also with the JDLink MTG. No need for an extra data plan (SIM-card), a separate Mobile RTK Access license, or an extra Mobile RTK modem. You get everything out of one hand.